Details of the Underground Railroad in College Hill are now known because Harriet N. Wilson wrote a letter in April, 1892 about her memories of that time to Prof. Wilber H. Siebert of Ohio State University. Siebert collected stories about the Underground Railroad from his students and other people that might have known about or participated in the workings of the movement. Siebert traveled across Ohio verifying accounts and talking to old residents; discovering escape routes and forgotten way stations. This data was compiled in several books and maps and Siebert’s collected letters are available through the Ohio Historical Society. The Wilson house was an active station until at least 1852. In the 1850 census, in addition to the parents were four adult children, three grandchildren, Aunt Peggy, and an unrelated young man (either a boarder or family employee). Of the family- Mary Jane Pyle, Theophilus, David, Joseph and Harriet were all active participants and their participation was mentioned in Harriet’s letter. Another son, Jesse, fought and died early in the Civil War. The large Wilson family came from Acworth, New Hampshire, and trace their line to Rev. John Wilson, first minister in Boston. Samuel and his wife, Sally Nesmith, came to Cincinnati at the urging of Samuel’s brother, David Wilson, who was well established in Cincinnati, building the first brick house and owning the first carriage in the city. He told them of the mild climate and rich soil and offered his help in their resettling. After spending thirteen years trying to farm the thin, stony soil of New Hampshire and enduring the long, cold New England winters, the family decided to emigrate. In 1831 they purchased a rundown farm from an estate in Sycamore Township, near Reading, Ohio. The seven children helped however they could. The farm was 166 acres, only partially cleared and contained a log cabin. At a camp meeting held in Reading in 1835, Sally became converted to Presbyterianism. She joined the Reading Presbyterian Church. The rest of the family joined this church by 1840, taking the temperance pledge and speaking out against slavery. While George Pyle was a student at Lane Seminary, he served for three months as the pastor of the Reading Presbyterian Church. He became an abolitionist as a student in Alton, Illinois and was a co-signer to the Anti-Slavery Convention called by Elijah Lovejoy. Daughter Mary Jane Wilson married George Washington Pyle in 1843 and moved with him to Illinois where he served as chaplin at Monticello. The Wilson family were criticized for their abolitionist views by others in the community. After a string of bad luck, they decided to move to College Hill. The Wilsons bought land from Freeman Cary and stayed with him until their house was built (1849), incorporating the tiny cabin already on the property. Originally the residence was oriented towards Hamilton Ave. and south of the Ohio Female College but later a street was cut next to the Wilson property. A new house entrance was built to face Aster Place. The Greek Revival style house at 1502 Aster Place is still there and is currently undergoing restoration. Several of their children attended The Cary Academy and/or Farmers’ College. The presence of the two colleges in College Hill attracted other Presbyterian abolitionist educators. 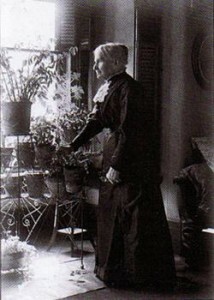 Mary Jane Pyle had joined the first faculty of the newly opened Ohio Female College (1849). The brothers, David M. and Joseph G. Wilson, while attending Farmers’ College were aiding abolitionist William Beard in moving freedom seekers from Lane Seminary (Walnut Hills) to Beard’s home in Salem, Indiana and then on to Fountain City, Indiana, where Levi Coffin lived.According to Harriet’s letter, Joseph would get woman’s clothing from his fellow students in order to disguise the freedom seekers. David later attended Lane Seminary and cast the first abolitionist ballot in Ohio. Theophilus was the eldest child and in 1836 wanted to become a minister. His father refused to allow him to enroll, so in March 1837 he left home and bought Congress land in Mercer County, Ohio where abolitionist Augustus Wattles had already established an African American farming community and Underground Railroad station, Carthagena, in 1835. Carthagena had a mixed race manual labor school founded by Wattles. Wattles had attended Lane Seminary, was a friend of Theodore Weld, and was the Ohio Anti-Slavery Society representative in charge of education for free blacks in Ohio. Theophilus later left Carthagena in 1843, purchasing the town site of New Corydon, in Jay Co., Indiana. He also bought the grist and saw mills there, opened the first store, a tannery and was the first postmaster. He later became a state Senator, representing Jay and Randolph counties. He returned to Cincinnati, buying property in Avondale in 1855, although he kept land in Indiana. He spoke at the Golden Wedding Anniversary of Levi and Catherine Coffin in 1874, recounting working with Levi at the Colored Orphans Asylum. He also served as executor of Levi Coffin’s will and as a trustee of Catherine Coffin estate when her possessions were sold. Many years later, John O’Neil recalled that while he was a young boy, African Americans came to the Wilson house, which his parents purchased in 1926. They would recount stories of themselves or family members who had been sheltered by the Wilsons during their flight north. 1. Merrill, Rev. J. L., History of Acworth, 1869. 2. Today this is Columbia-Tusculum, a neighborhood of Cincinnati. 3. From the history of the Wilson Family, manuscript by Samuel Tynsdale Wilson and read while in the possession of Jack O’Niel who bought the Wilson House after Harriet Wilson died.